These novels aren't just for empty nesters, but they explore issues that are all too familiar to families going through this dramatic transition in life. Great presents for parents! 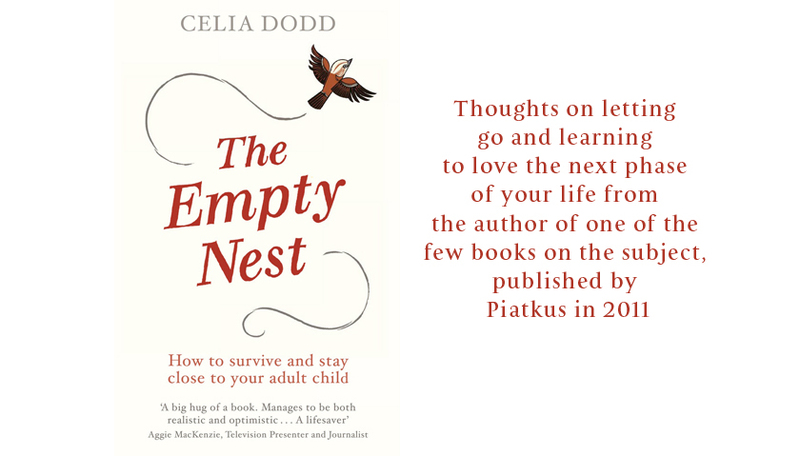 And if you're looking for non-fiction support and advice, there's always my book The Empty Nest: How to Survive and Stay Close to Your Adult Child! These are my eight top reads - great for dads as well as mums. The ultimate empty nest meltdown. And proof, if it was needed, that the empty nest affects men too. It's hard for any parent when a child moves an ocean away. But in the Fifties communication and the cost of travel made everything much harder for parents and kids. This often unbearably sad story about emigrating sees things through the adult child's eyes - a viewpoint surprisingly rare in empty nest discussions. This wonderful novel is about so much more than the issues facing empty nesters. But at its heart is a raw, painful portrait of a family and a mid-life marriage in crisis. All the humour and caustic wit you'd expect from Townsend, with some brilliantly irritating characters (Poppy is classic) but it's touching too. A thriller - sort of - in which a murder from the protagonist's hippy past comes back to haunt her and tests her relationship with her husband and daughters to breaking point. Three women have shared school runs and summer holidays since their children were babies. When their kids leave home, secrets and lies are exposed which threaten their marriages - and their friendship. You'd think I would be used to saying goodbye by now - after all, it's nearly ten years since my eldest left home. But when I waved our youngest off to the US yesterday morning I still felt the same old painful pang. That moment of parting, as your child walks away from you and into his or her new life, always makes me sad. There's something specially disconcerting about knowing that the person who used to be your baby is hurtling thousands of miles across the globe. It just feels wrong to be so disconnected, so helpless if they need you. But at least the strange limbo of the past 24 hours before parting is over - that's another thing I still struggle with. It's so hard to settle when you're trying to make the most of someone's company yet missing them already, trying not to get tetchy or nag about the lack of plans; trying not to sound like my own mother, basically. In so many ways life has become oddly fuller since our nest emptied, but there will always be moments of sadness and nostalgia. These days, thankfully, they are moments rather than days or even weeks. Of course I felt sad going home to the dregs of comfortable chaos in my daughter's bedroom, with the bedside light still burning. I admit I couldn't bear to switch it off for a while, and I even put on her old jumper, with that lovely smell of cigarettes and Stella. And every time a plane flew over I thought about her arriving in Chicago with nowhere to stay. But by the time her text came saying 'Made it!' I was already moving back into my own new life. One thing I found really sad this Christmas was buying presents for my kids. It never used to be a problem, when letters to Santa were meticulously detailed, and you were bound to end up with at least one thing that made their Christmas Day special. And as they got older you knew just from living with them what their hearts most desired. But now that we don't live together I feel completely out of touch with their interests and tastes - even my daughter's. For the last few years I've rushed round buying shirts and bike gismos and DVDs that I hoped might be just the ticket, but which the boys acknowledged politely and took straight back to Uniglo and HMV. So this Christmas I gave up. I decided not to stress myself out searching obsessively for the perfect gift, but to give simple, useful stuff: underpants (oops), novels, wine, recipe books (the brilliant Ottolenghi) plus a selection of hard-to-find Middle Eastern ingredients. All a bit impersonal perhaps - and I could see the kids were puzzled. But for me there was a big bonus: all my energies were focussed on what matters more as the kids get older - not the annual present fest but just enjoying being together. These days it's really rare that all three are at home at the same time, and in the past Christmas has slipped through my fingers in a fug of distractions. Not this year: we played poker and chose our top tunes of 2012 into the wee small hours. And I made one New Year's Resolution: to give them what they really want for their birthdays in 2013. I just have to work out a way of finding out what it is.